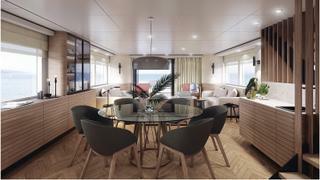 Vripack described its interior design as "homely Scandinavian chic"
Dutch design studio Vripack and US yard Nordhavn have launched a collaborative partnership and presented their first concept, the N80. 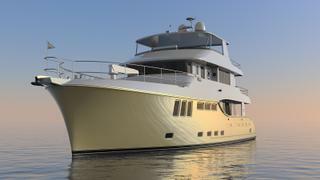 The 24 metre explorer inspired superyacht design was revealed at the Fort Lauderdale International Boat Show. Accommodation will be for eight guests in four cabins, including a master suite on the main deck. Other features include enough storage for two tenders, a large swimming platform and an optional Jacuzzi. The N80 will see Nordhavn’s “classic nautical American interiors” replaced with Vripack’s “homely Scandinavian chic environment", which will be punctuated with “accents of daffodil yellow” and “midnight blue hues”. Key materials meanwhile will include “muted woods”. As a result, the N80 is “an expedition wolf swaddled in Hygge’s clothing,” the two companies said. Vripack also revealed that it intends to introduce the use of VR headsets into its client consultation process. The headsets will enable clients to experience the proposed interior design in 3D, rather than two dimensional drawings and renderings, and make tweaks accordingly.